The Suquamish Tribe believes that our employees are one of the most important assets to the success of Tribal Government operations. We have a strong commitment to provide employees with a positive, productive work environment with opportunities for personal satisfaction and growth in a safe, healthy, and harmonious work environment. The Suquamish Tribal Government currently employs 345 staff members in the areas of Administration, Human Resources, Community Development, Early Learning, Education, Finance, Fisheries, Human Services, Health Benefits, Indian Child Welfare, Information Systems, Legal, Maintenance, Natural Resources, Public Safety, and Tribal Court. 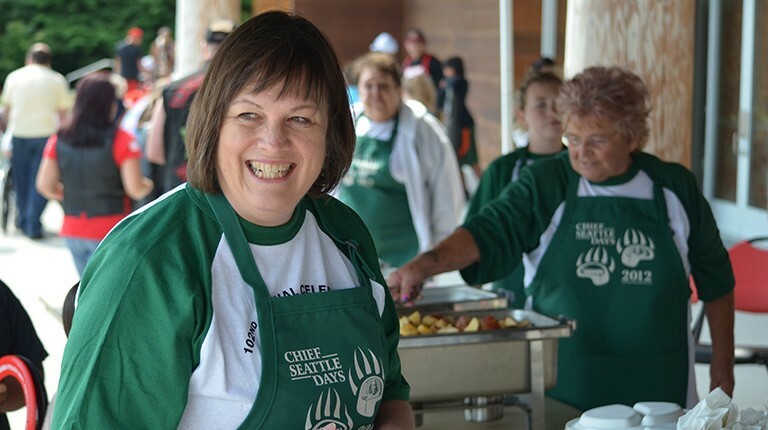 Many employees, like Controller DeeAnn Simpson, volunteer during the Suquamish Tribe’s annual Chief Seattle Days event. Complete an application and upload your resume in one easy online process. Download our specialty application for public safety work in the Police Department. Save a copy of our application to complete offline and turn in at our offices. Interested in jobs at Suquamish business operations? Need help creating a resume and cover letter? Interested in interview tips?